Designed and manufactured in South Africa, The Bush Company Clamshell Roof Top Tent – Black Series edition is unrivalled in its quality, simplicity and practicality. 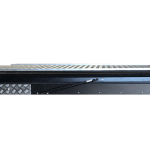 With a setup/pack down time of under 90 seconds and a 75mm high density foam mattress 1.3m wide and 2.15m long, this really is the ultimate in comfort and convenience and a superb addition to any camping/touring setup. 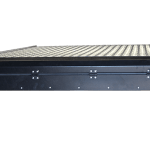 There is 12V power pre-installed, including an LED light in the roof of the tent, and 1.8m extruded roof rails as well as heavy duty extruded rails on the underneath of the tent making fitment to vehicles or canopies incredibly easy. – Fast set-up and packdown time – less than 90 seconds. 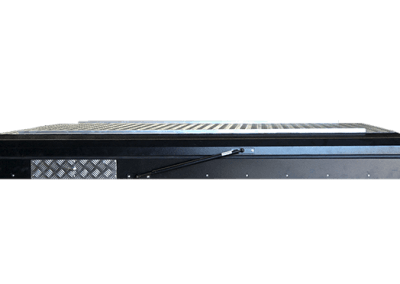 – Fully welded aluminium base frame and roof frame powder coated black. 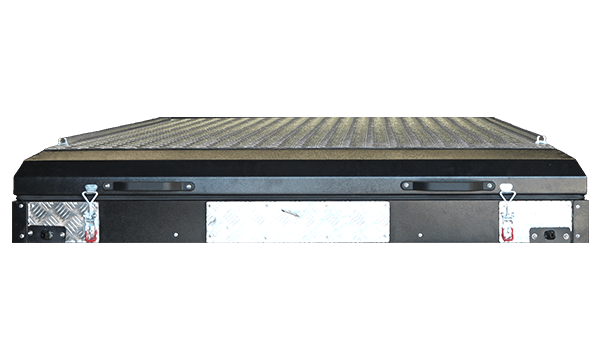 – Chequer plate 1.5mm floor and roof. 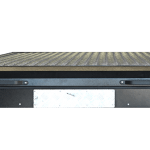 – Internally reinforced roof can take up to 50Kg of additional weight. 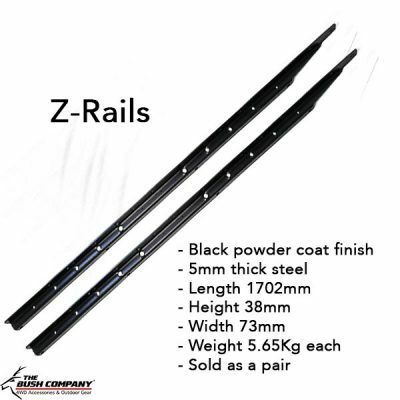 – Extruded roof rails 1.8m long on both sides, suitable for M8 bolts. 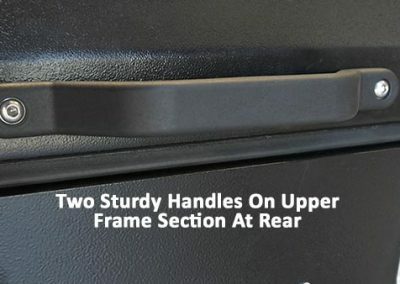 – Heavy duty gas struts on both sides. – Internal LED light (White and Yellow) and pre-installed 12V wiring using Anderson plugs underneath and inside the tent. 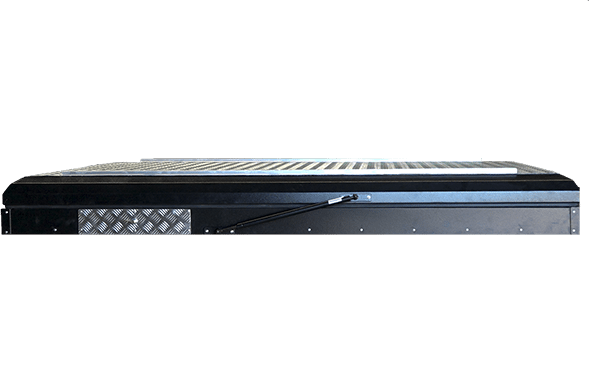 – Internal height of 124cm when open at head end from top of mattress to roof. 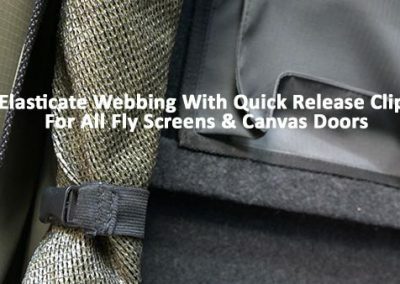 – Heavy duty 460g ripstop, mould resistant canvas. 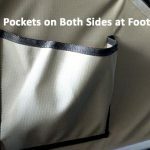 – Large easy set up rain fly on rear and both sides of tent. 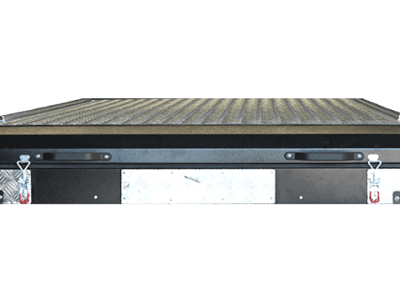 – 750mm super high density foam mattress 130cm W and 215cm L with removable canvas cover. 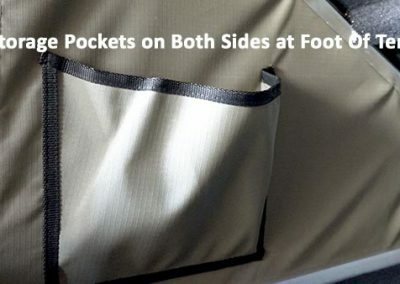 – 12cm gap inside tent when closed for storing bedding etc. 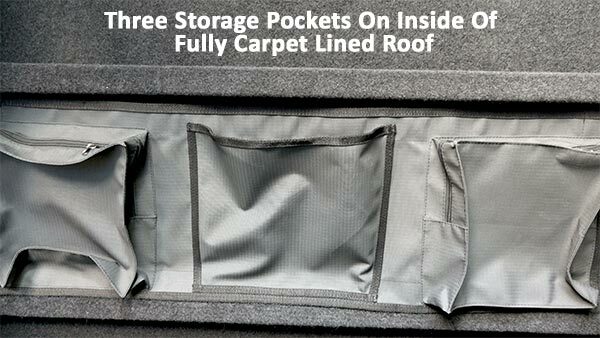 – Internal storage pockets on roof and also on sides. 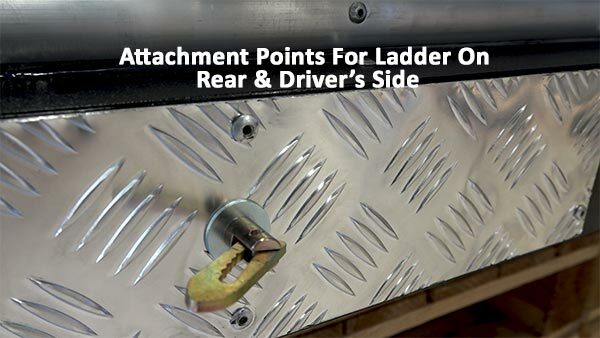 – Telescopic ladder in seperate canvas bag, can extend up to 2.5m. 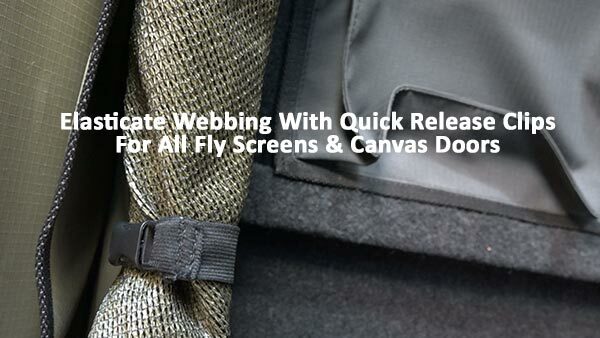 – 2 Year Warranty on structure, canvas and fittings. 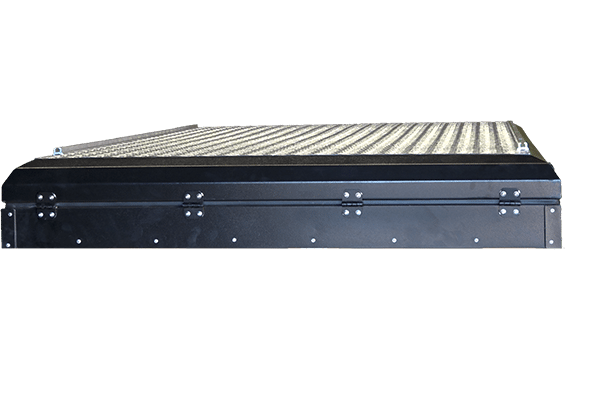 – Four extruded rails underneath tent running crossways for easy fitment to vehicles. The extrusions are 50mm wide and are 398mm apart with the distance from the end of the tent to the first extrusion being 423mm. At the Bush Company we are constantly striving to improve our product design and exceed your expectations, and the Clamshell Roof Top Tent – Black Series edition does just that. 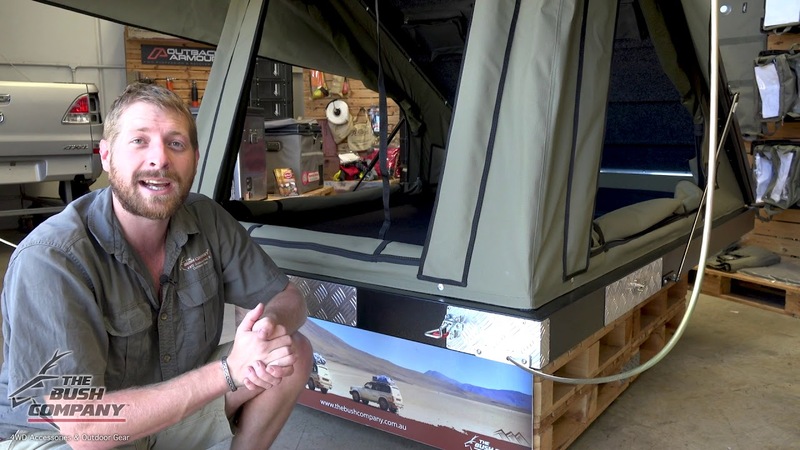 Designed and manufactured in South Africa the Clamshell Roof Top Tent – Black Series is a superb addition to any 4WD touring set up and presents a lower profile than standard roof top tents. The frame of the tent has outside dimension of L 225cm W 140cm (145cm including gas struts) and H 25cm (including the roof rails). 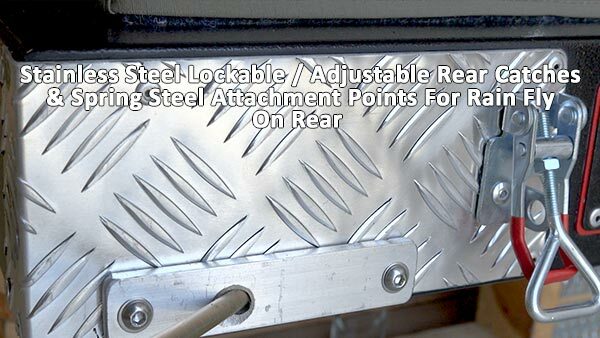 The frame of the tent is folded 3mm aluminium with fully welded seams and corners. 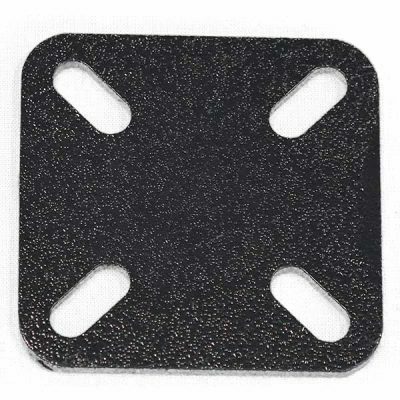 Both the base and the roof are powder coated black with a rippled finish, the top section of the roof and the base are 1.5mm checker plate. 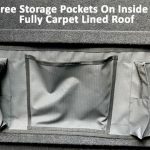 Inside, the roof has 5 aluminium cross sections on the inside to provide additional strength, allowing up to 50Kg of weight to be carried on top of the tent, the inside of the roof is also fully carpeted providing additional thermal properties that assist in reducing condensation. 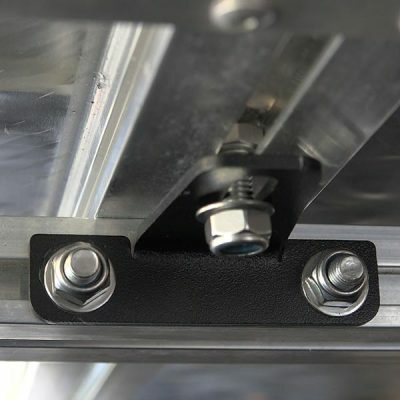 The two extruded 1.8m roof rails take an M8 bolt for attachment of accessories such as a solar panels or eye bolts to provide perfect tie down points. 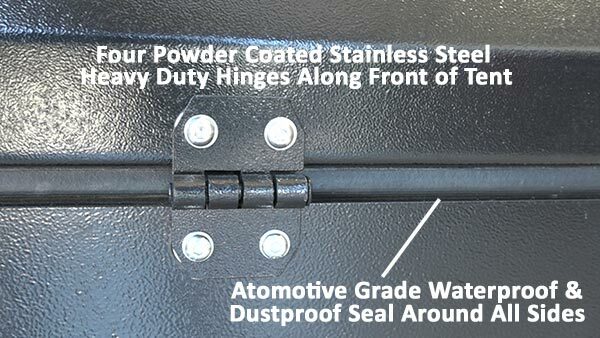 The heavy duty gas struts on either side of the tent allow for easy put-up by one person in under 90 seconds. When packing away there is a bungee cord that goes right around the canvas to assist in pulling in the sides of the tent, and a long strap at the rear of the tent for starting the closure of the roof. 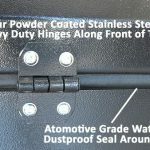 The tent has a fully waterproof and dustproof automotive grade rubber seal when closed and there are two adjustable lockable catches on the rear edge and two sturdy handles. Underneath the tent there are four 50mm wide extruded heavy duty aluminium rails that run crossways underneath the tent. 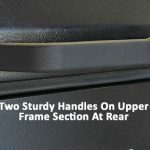 These extrusions take an M8 bolt and make fitment of the tent to roof racks, roof bars or canopies really straightforward. 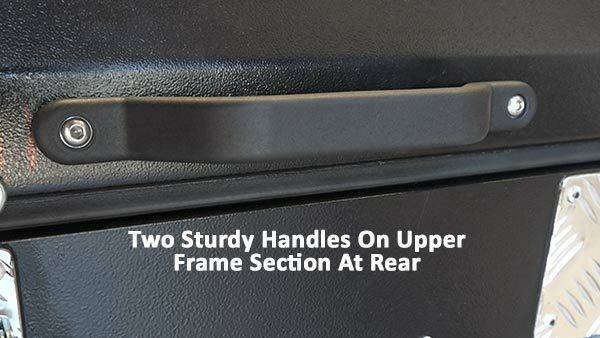 The outer rails are 423mm from the outside edge of the frame and are 398mm apart. 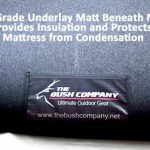 The tent itself is made from military spec heavy duty 460g ripstop canvas that is mould resistant and rot resistant with triple stitched sealed seams. 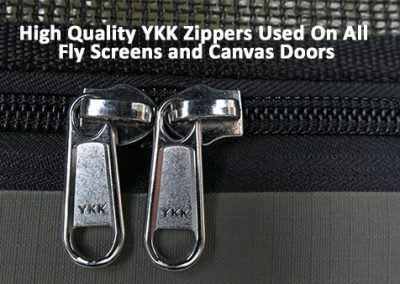 There are 3 large doors/windows each having mosquito mesh on the inside and canvas cover on the outside, all secured with high quality YKK zippers and elasticated clips for storage when rolled up. 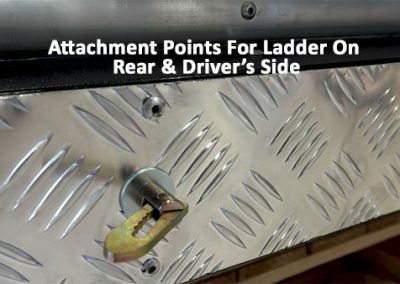 Access to the tent can be from either the driver’s side (if entrance is to rear of vehicle) or to the rear using the telescopic ladder that locks in place and is stored in its own heavy duty canvas bag to ensure no sand or dirt gets in the vehicle or the tent. 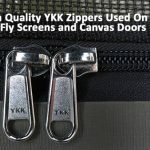 There is a rain fly at the rear and on both sides of the tent, which is easily set up using to spring steel bars that are stored inside the tent when not in use. The rain fly ensures that except in driving rain conditions very little rain reaches the main body of the tent helping to eliminate damp on the outside of the walls of the tent when it comes to packing away. The tent is pre-installed with 12V electrics; there is an LED light attached to the roof of the tent and an Anderson plug on the base of the tent at the foot. You can run a small fan or provide power to charge mobile phone, iPads etc. from inside the tent. 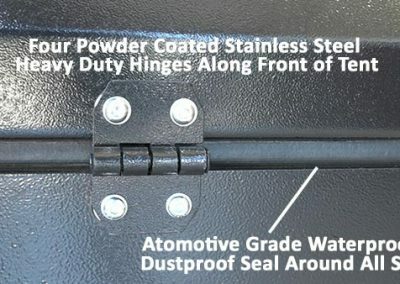 Underneath the tent at the hinges end there is another Anderson plug which can be connected to your vehicles 12V power supply. Inside the tent there is a super heavy-duty 75mm thick mattress that measure 130cm wide by 215cm long. The mattress is covered with a very durable canvas cover that can be removed for cleaning if required. 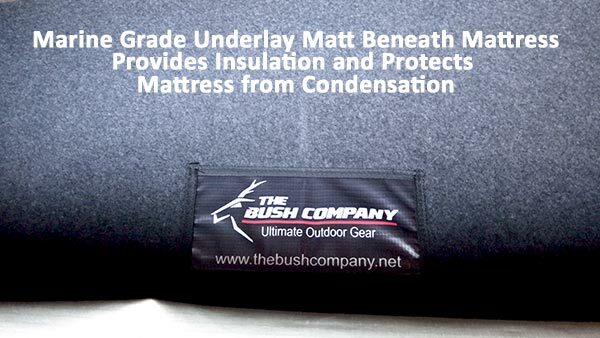 Underneath the mattress there is a marine grade thermal carpet that provides additional padding/insulation and also help to reduce condensation build up and prevents it from reaching the mattress. 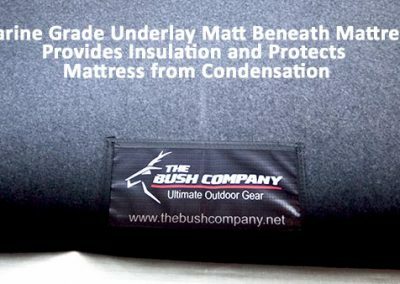 Around all sides of the mattress there is a 2cm gap between the matress and the frame of the tent which assist with airflow around the base of the mattress and also prevents moisture on the inside of the frame from reaching the mattress. 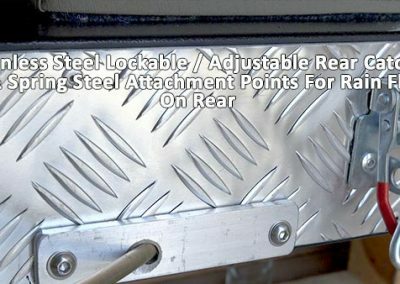 There is storage for the telescopic aluminium pole at the head end of the mattress which can be used to support the roof of the tent in the very unlikely event that one of the gas struts fails or is damaged when off-road. When open, at the head end of the tent there is a total of 124cm head room and 16cm at the very end of the tent. 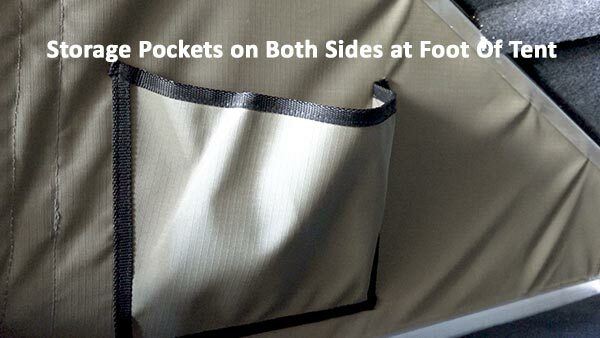 This makes it easy for even a tall person to kneel up inside the head end of the tent if required. 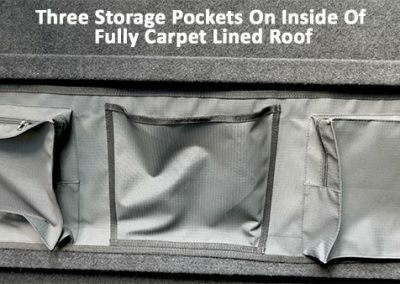 Storage pockets are located on either side towards the foot end of the tent, plus there is a set of canvas storage pouches that has two zipped pockets and an open pocket, these are velcro backed so they can be located at different points of the roof to suit your needs. When the tent is closed there is a 12cm gap between the roof of the tent and the top of the mattress which is ample room to keep your bedding set up, or for storing clothes in a completely dust free environment, or providing secure storage for fishing rods or hunting equipment. 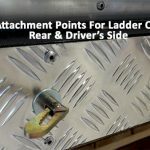 We can supply brackets for fitment of awnings to the passenger side of the frame of the tent, and we have a range of brackets available for fitment to a range of roof racks and bars. We are also able to fit solar panels to the roof of the tent. We are happy to discuss these options with you prior to ordering. 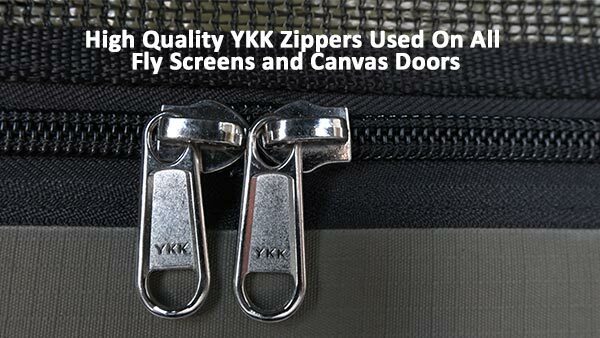 There is a 2-year manufacturer’s warranty covering the structure, fittings and canvas. 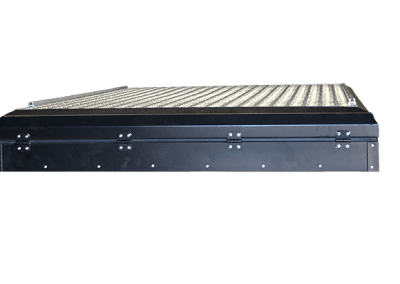 – Aluminium base frame and roof frame powder coated black.